Mission: to promote the fellowship among Indian people of all Tribes living in metropolitan Chicago, and to create bonds of understanding and communication between Indians and non-Indians in this city. To advance, the general welfare of American Indians into the metropolitan community life; to foster the economic and educational advancement of Indian people; to sustain cultural artistic and avocational pursuits; and to perpetuate Indian cultural values. The AIC strives to be a vital cultural and community resource for nearly 65,000 American Indians in Chicagoland’s six county region. Through a combination of short-term relief services and long-term education and support programs, we seek to foster physical and spiritual health in the community, an active connection with traditional values and practices, stronger families with multigenerational bonds, and a rising generation of educated, articulate, and visionary youth. The AIC focuses on three areas of individual, community and program development: Education, Wellness, and Arts & Culture. Each serves to engage and involve our community while seeking to better understand its needs. 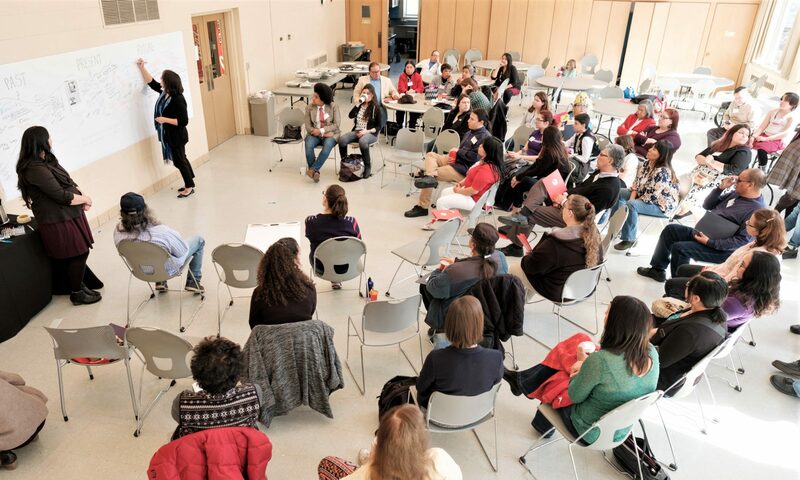 Over the past nine years, AIC has been developing innovative methods in learning environments as well as Professional Development Programs based on our Native American cultures. We have created exciting new programs that support teachers in engaging new content and students’ outside the physical classrooms; we take them into the neighborhoods and environments in which they live. We also feel that our focus on Social Science and STEM programs offer an outstanding learning environment for the student. The foundation of this methodology was developed at the American Indian Center in partnership with Northwestern University, University of Washington and the Menominee Nation. AIC Wellness programs are established to promote healthy lifestyles and raise awareness of health issues among Native people. We promote health and education by merging ancient tradition with modern lifestyle choices. The core programs include: senior lunches combining nutritious meals, structured socialization and health screenings, and the social service program, an in-house food pantry that provides food and clothing to homeless and low-income individuals. AIC Wellness also tends a Native Medicine Garden for community education and use, and it brings free nutrition education programs to the community. Art and culture have always been important aspects of Native American tradition. Today, they help to articulate the character and identity of Native people. AIC programs enrich local American Indian culture through contemporary and traditional Native Arts. AIC provides an extensive schedule of events, performances, and exhibits in an effort to retain and celebrate the culture, tradition, and values of Native Americans. AIC continues to host nationally renowned Native musicians and holds workshops led by acclaimed Native artists. AIC also hosts powwows, ranging from small community events to one of the largest powwows in the Midwest. Finally, AIC coordinates museum partnerships to share the Native experience from respectful and accurate perspectives.